This entry was posted on January 11, 2018 at 7:18 am	and is filed under Climate claims. You can follow any responses to this entry through the RSS 2.0 feed. You can leave a response, or trackback from your own site. 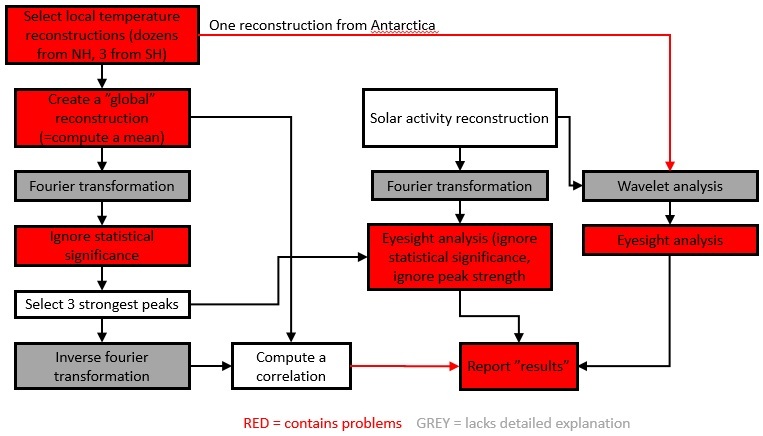 Thanks for preparing the diagram at the top, it clearly shows some of the more egregious errors, but what is “eyesight analysis”? You mean informal analysis of a graph, commonly known as “eyeballing”? 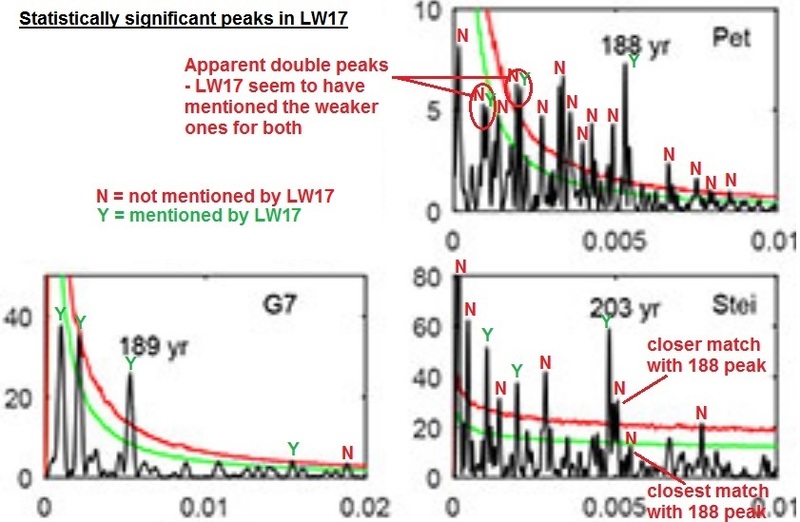 I can see how using a Fourier transform might cause the warming of the last 65 years to be ignored, since a single time-domain step is spread out in the frequency domain. Relying heavily on a Fourier transform seems like a variation on “assuming the conclusion” – the conclusion being that natural cycles control climate. Fourier transforms are the perfect tool for finding cycles and downplaying singular events. I meant eyeballing, yes. LW18 use “eyesight” so I used it also. On Fourier transforms, the little experience I have is from 20 years ago, so I couldn’t comment on that part of LW18 much. One thing I was wondering about inverse Fourier transform was that is it possible there to control the phases of the sine waves so that one can for example force all three sine waves peak at certain points? For example, if one would like to make it appear that those three sine waves create the recent warming, would it be possible to force the sine waves to peak at about year 2000? Fourier transforms preserve phase information. The phases are separated from frequency and magnitude so they can easily be modified. Such a modification would alter the whole timeline, but I guess the change could end up being more noticeable at a single location. Ok, thanks. I’m not claiming fraud either, and I guess I should have worded my last comment a bit differently. It’s of course impossible to say if they did something wrong with the Fourier transforms as they don’t explain those steps at all.